One week after our adventure began I still cannot believe I did The Overland Track through The Tasmanian Central Highlands in winter. When my friend Michael invited me to take on The Overland Track Winter Trek, also known as The “Tassie Tuff'”, I really had no idea what I was getting myself into. With much trepidation, I packed my backpack and sleeping bag (both borrowed) as I didn’t own such things and off I went to Launceston for two days of preparation with the Peak Potential Adventures team. After their careful analysis of the contents of my backpack (I can’t believe they made me take out my coffee machine and makeup bag), my pack weighed in at 15 kilos and armed with everything I needed for 6 days in the wilderness – rehydrated mince sachets; baby wipes; sunscreen; 2 minutes noodles and about 3 kilos of chocolate. I was ready to go. We met the other members of our group before we left and bonded over a beer and a burger on the eve of our departure. 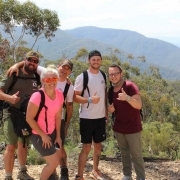 Up bright and early on Sunday morning, Darren Wise and Shane Pophfer (Peak Potential Adventure guides and former Paratroopers) myself and 4 strong fit men boarded the bus to begin The Overland Track adventure. I cannot lie, I had moments of reflection on my decision wondering how I was ever going to keep up. I knew this was going to be the challenge of a lifetime but there was no turning back. And then the magic began. After a short ferry ride and with absolutely no expectations of what lay ahead, we headed off to reach the first cabin (about a 4 hour walk). The terrain on The Overland Track was a combination of mud, snow and slippery tree stumps (not for the faint hearted I thought). At a cracking pace, we made it just before nightfall and I can’t believe how much I was looking forward to rehydrated mince and freeze-dried peas. Day 1 was tough as it was all incredibly new and a bit daunting. Day 2 we were up early and on our way for another full day of climbing. This was a tough day but Darren and Shane made sure we had frequent stops to rehydrate and take in the view. It was spectacular. Day 3 we got our groove on and things really started to fall into place. The scenery was breathtaking. Each day threw up new challenges, Day 3 was 6 hours of walking through knee deep snow and ankle-deep mud, but the enchanted rain forests and the incredible mountains we were passing kept us awe-inspired and motivated. The rest day at Pelion Hut was much appreciated as we had additional food bought in and the fruit cake and custard Shane and Darren organised was like all our Christmases had come at once. I couldn’t help but think they were sweetening us up for what was yet to come and I may have been right but as we got used to the terrain and the weight of the backpacks we all seemed to take each day’s new challenge as it presented itself. The good humour of the group also went a long way to get us through. On our last day after 17kms of more snow, steep inclines, mud and rocks (and even more spectacular scenery) we finally made it. We had conquered The Overland Track in winter and I could not have been more proud of myself and my team. There is no way I could have done this without the incredible support of Darren and Shane. Shane for his incredible kindness; patience; sincerity and calm soulful demeanour (and his incredibly funny and entertaining stories) and Darren for his professionalism and unconditional focus and commitment on the comfort, safety and wellness of each member of the team. Micky, Conrad, Matthew and Chris were all amazing team members whose sense of humour, kindness and protection of me helped to get me through. It was a tough challenge but I am so glad I did it. These fond memories will stay with me forever. Thank you, Shane and Darren. You amazed me every day and I cannot wait for the next adventure we can do together.